Practice research remains a hot topic and we wanted to add a super speedy twitter layer to our network to promote events and share news. If you have a twitter account please link to @4junegroup. (d) facilitate the sharing of experiences and expertise. The event happily included a number of representatives working in the arts and humanities as well as interdisciplinary and STEM fields. The audience in attendance was a healthy mixture of academic and professional services staff from a variety of disciplines. Using non-specialist language, I explored my own academic practice research methodologies in my presentation “Method is Impact is Outputs: Non-linear Approaches to Impact Generation to Practice Research”. I high-lighted some of the debates that are circulating in practice research spheres, whilst showing that ethnomusicologists can be practice researchers and some of us are especially capable of generating Impact. Although being affiliated to a Psychology department, I am not a psychologist, but an applied, medical ethnomusicologist: for simplicity’s sake, an anthropologist of music who uses applied, culturally appropriate methods to promote wellbeing through the making of music. Colleagues of mine, particularly in the USA, work on projects related to HIV, Malaria and water sanitation. I believe that some of our collaborative, performative, ethnographic approaches might be useful to other forms of practice research, as a way of evidencing impact and documenting the research process. My own research question was: How does Christian choral singing impact on the construction of Australian Aboriginal identities? To answer my question, I facilitated an Indigenous Australian choir in Hopevale, Cape York in Australia, singing at prisons, Indigenous rehabilitation centres, for tourist audiences and for community events as well as regional artistic ventures, such as the Queensland Music Festival. We performed. We practiced together, and I researched with the help of my singers. I found that if done in culturally appropriate ways, choral singing has a positive impact on identity constructs. It showed the wider world that, in the words of one of my singers: ‘more than drunks come out of Hopevale’. The choir and I appeared on radio and in the local news. We even made a little bit of income which was set aside in the bank for future choir initiatives. My method: choral facilitation, led to outputs: performances, concerts and rehearsals, a radio appearance, mentions in the local news and invitations to perform at festivals. The impact: wellbeing for the singers and their relatives in rehab or prison and a heightened awareness of Australian Aboriginal diversity amongst tourist audiences in Outback Australia. About my impact: impact did not occur after my research. It occurred during my research and in turn led to new questions arising. The Impact was non-linear. This non-linear creation of impact is not well-understood by the sector at large currently. Practice researchers have a role to play in helping shape better policies and administrative procedures by sharing their views constructively on this subject. To conclude, practice researchers should consider ethnography, auto-ethnography and philosophy as ways into investigating impact and co-creation. In ethnomusicology we have addressed the challenge of writing about music (i.e. the textual/ experiential debate) by using philosophy. Hermeneutics, phenomenology, existentialism and intersubjectivity in particular have allowed us to explore how the co-creative process of performance leads to the creation of new knowledge and how best to convey this new knowledge on paper. Philosophy has encouraged ethnomusicologists to question to what extent it is possible to comment accurately on other people’s experiences of creative practice (an exciting area of enquiry in neuropsychology too) and to think about what this means for studies of impact. This philosophical background combined with musical practice is then supported by the ethnographic evidence: interviews with performers, audio visual examples of performances and the co-creative processes. Where possible ethnomusicologists then validate their interpretations of the co-creative experience by involving musicians in the academic analyses. If the researcher is the creator, then auto-ethnography is employed. We share with our co-creators what we have written about them and the processes of creation, ensuring that the presentation of this new knowledge avoids ethnocentric biases and acknowledges context-specific responses to creative processes. In some cases, ethnomusicologists have also been drawn to poetics and creative writing as a means of representing their intersubjective, embodied musical experiences on paper. These approaches not only allow ethnomusicologists to problematize the concept of ‘impact’ as it pertains to practice research and its outputs, but within the written ethnography and ethnographic method there lies ample opportunity to discuss with artists and musicians how the creative process might be understood to be impactful beyond the academe and how this might be best evidenced, using appropriate techniques that are discipline-specific. My belief is that the combination of approaches used in ethnomusicology is transferable to other areas of practice research and if this approach resonates with you then I would be interested to discuss this further so do contact me. As a reminder of our symposium, all of the materials from the event are now available to download. The slides, notes and podcasts are organised by session and speaker. You are welcome to share the materials and please reference the speaker and event. The University of Surrey are hosting a Practice as Research Festival at the Ivy Arts Centre this Saturday from 10.30am until late. Reflection on Breakout Session 1: how can we best demonstrate excellence in practice research? The short answer is that the international academic standard for excellence – rigorous peer review – should be applied, and subject associations should be approached to test levels of interest in piloting PR peer review networks. This would have real advantages for the reliability of research assessment exercises, and benefits should accrue to those engaged in processes, outcomes, and – as appropriate – research outputs, also. Drama and Dance (REF UoA 35) does not overtly rank journals or academic publishing houses for purposes of grading degrees of excellence, as is the case in some other disciplines. There is a peer group consensus that this is a good policy, enabling a broad range of work, and working circumstances, to be put forward for evaluation. It does also burden evaluation panels by requiring that they perform rigorous assessments of quality more or less ab initio, and inconsistencies in presenting PR outputs can, understandably generate systemic problems of evaluation, not least of consistency of judgement, and assessment narratives. The problems appear to deepen where research underpinning Impact claims is under consideration, and chairs of sub-panels (Delgado) and main panel (Brown) have gone on record since the REF 2014 results were published, expressing frustration at the blurring of lines between Practice and Practice Research in outputs classified below the threshold required to support Impact claims. Across performance sub-disciplines, the matter has attracted attention to the extent that in recent issues of Studies in Theatre and Performance (Routledge), a proposal to establish a section of that journal, ‘Curating Practice-as-Research’ (Hann and Ladron de Guevara, 35.1: 3-6, 2015(a)) led to ‘A General Call for PaR Contributions’(Hann and Ladron de Guevara, 35.2: 159-160, 2015 (b)). HOW SHOULD WE PEER-REVIEW PRACTICE RESEARCH? This brings into focus the matter of how peer review might play out in practice, and how its processes might be, themselves, demonstrably rigorous and reliable. Establishment of Peer Review Network: Subject associations – ideally in concert with HEFCE – would solicit interest in joining a peer-review network from Practice Researchers in a discipline. They would be selected on the basis of CV and statement of areas of expertise. Identification of peer reviewers: A Researcher proposes a project, to be carried out over a specified period of time, notifies the network, which posts a call for peer reviewers, as appropriate (one PR researcher; one practising artist, for example). Engagement with process: Negotiable. Note that, depending on the nature of the work, this might make blind review impossible, and would require a more open, dialogical, process. It is not difficult to establish the rigour of such processes, as is the case for QAA panels conducting institutional audit, for example, and clear statements as to ensuring rigorous review would need to be made available. At the conclusion of the process, research processes and/or outputs which satisfy the conditions negotiated during peer review would be entered in an index of work done over a given period. This could be done by archiving what Hann and Ladron de Guevara (2015 (b): 159) refer to as a ‘curated portfolio’. Once indexed, the quality of the work would be established, and, in the case of Impact claims, submitting institutions and evaluation panels could concentrate on establishing the case for impact, rather than revisiting possible problems around the status of the research. One of the issues identified by Professor Bruce Brown, Chair, Main Panel D (REF2014) was the relatively low number of PR outputs submitted to the recent exercise (37%). He suggested that this might be because of a lack of confidence on the part of researchers, and, even more so, on the part of institutions, increasingly swayed by risk-averse research managers seeking to maximise institutional funding and reputation. Perhaps the suggestions in this note will contribute to a debate by means of which the aspirations and practices of practice researchers and institutional interests come closer to each other. Use of photograph courtesy of Edge Hill. Rachel Hann and Victor Ladron de Guevara (2015(b)), ‘Curating Practice-as-Research – A General Call for PaR Contributions’(Studies in Theatre and Performance, 35.2: 159-160). 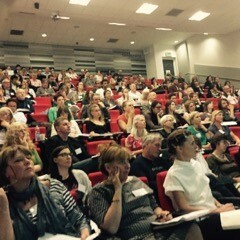 ‘The Future of Practice Research’ symposium at Goldsmiths, hosted in partnership with HEFCE on 4 June 2015, gave an opportunity for researchers, practitioners and research managers to explore new ways in which practice research is extending, and to influence broad agendas around assessment, funding and impact in a period of constant change. To those who made it to the symposium, many thanks for all your contributions! To those who didn’t, it was a full and fruitful day, and we decided to keep the conversation going with this blogsite. Building on all the vibrant work in our Practice Research community, we’re hoping this will lead to many new initiatives as well as provide a platform for debate and advocacy. So do have a look at the materials attached inserted within a reminder of the programme for the day – currently you’ll find all the notes from the afternoon breakout sessions. Our podcasts and slides will be added shortly. Further ideas, reactions, provocations? Let’s continue the conversation! Where is Practice Research now and how might it develop in innovative ways over the next decade? How can we best demonstrate excellence in Practice Research? How should we peer review Practice Research? How might we develop common languages and approaches across disciplines? How does Practice Research relate to the professional world, and how might we enhance such relationships? How can we best support and nurture Practice Research within higher education? What are the strongest ways to demonstrate the public impact of Practice Research? How might we reassert the importance of Practice Research, both within the academy and to a wider world?